The Lord answered her prayers on Sept. 7, 2018. 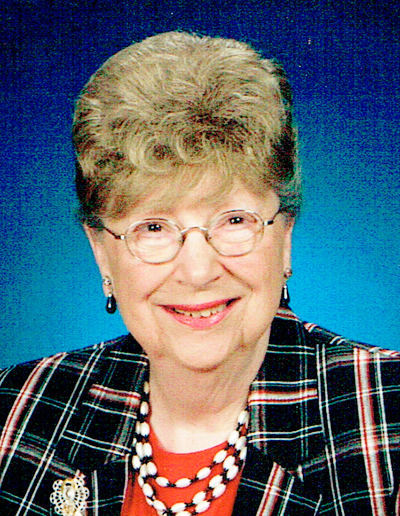 Shirley A. Aurand, 91, of Valley View, formerly of Alfarata, went to be with her Lord. Born Feb. 1, 1927, in Lewistown, she was the daughter of the late S. Creighton and Gertrude Mae (Wakefield) Wyland. She is survived by: her husband, Marlin G. Aurand, whom she married Sept. 2, 1950, as of Sept. 2, 2018, they enjoyed 68 years of marriage; a cousin; a sister-in-law; and numerous nieces and nephews, who she truly appreciated. She graduated from Derry Township High School in 1944. Shirley was employed at the Russell National Bank and then Omega Bank, serving as branch manager at the Fort Granville office, retiring in 1990. She also was employed at the Pa. Dept. of Public Assistance and Standard Steel. She was a member of the Ellen Chapel Church, serving as a Sunday school teacher, served both as church choir director for many years and as a choir member. She was also a member of Fort Granville Grange. Shirley enjoyed numerous crafts including painting, rubber stamping and pergamano. She will be remembered for her many cards crafted for family and friends. She enjoyed traveling, time spent in Florida over the years and recent trips to Deal Island the last few years. A viewing will be held from 10 to 11 a.m., Monday, Sept. 17, 2018, at Ellen Chapel Church, 11764 Ferguson Valley Road, with a funeral service at 11 a.m., with Rev. Gerald Peachey officiating. Interment will take place at Mt. Rock Cemetery. Arrangements are under the care of Heller-Hoenstine Funeral Homes, Woodlawn, 200 N. Main St., Lewistown. Memorial donations may be made in Shirley’s name to: Ellen Chapel Church, 11764 Ferguson Valley Road, Lewistown, PA 17044 or to a charity of your choice.